Very nice! I like the blur. I have been working on something similar for about a year now. I still haven't exported the graphics from Adobe Fireworks. No time to work on it. Well, Crestron is no picnic if you want to use your own graphics. Creating the graphics is only the first step. Adding them all to an existing or new theme in Studio is very time consuming. I spent months playing in Studio to get the point where I can basically customize anything I like, whether it is a simple button, all the way up to the media player smart object. The new templates on the other hand, use the best of both worlds. I leveraged the CT-Neo theme and created external libraries that can be overlaid on everything. I took all the hard work out by creating all the pre-made pages for all of the most popular resolutions. Last edited by gwstudios on June 10, 2018 19:41. I just wanted to let everyone know the new Crestron templates (Aleera) I released a few months ago are doing very well. I am working on a commercial template designed specifically for bar & restaurant control. 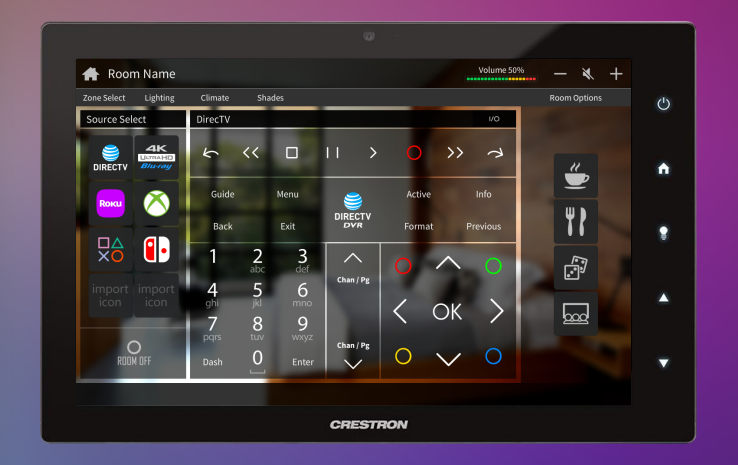 I already have something similar for another control system (RTI), but the Crestron version will be much easier to set up due to how easy it is to bring in subpage references and set them up in programming. If anyone is interested, I can post some screenshots. I think the iPad, the 1060 and 1542 may be the best candidates for this UI. Just putting some feelers out as to which panels you use most in these types of setups. Last edited by gwstudios on February 13, 2019 20:59. Quick update... I added a new "brands" icon set (flat style color - 691 icons in total) and changed a few aesthetics on every resolution. I also added a TST-902 resolution template by request as it is a strange aspect (1.6:1). None of the other templates lend themselves very well to a "save as" / resize for this particular controller.